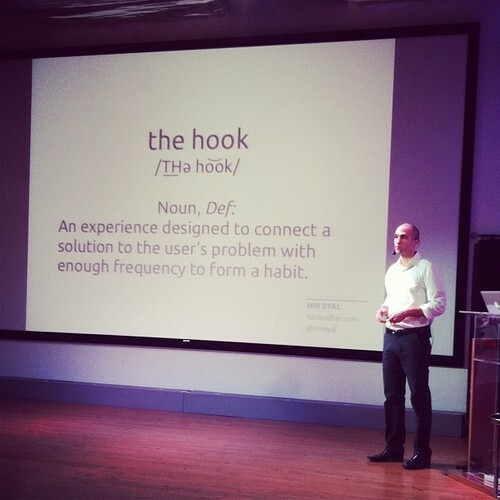 Last week I attend 2 days workshop by 2 brilliant guy, Nir Eyal @NirEyal and Sangeet Paul @Sanguit by @atamerica– it was JP @JPEllis, the co-founder of award winning app Harpoen, who notify and remind us about this event. Nir Eyal is a lecturer from Stanford Graduate School of Business and has been writing for Forbes, Techcrunch and Psychology Today. The last one actually what makes me very interested to know more about Nir’s insights. Because the theories in psychology are important and applicable to understand our users. Nir offered Hooked! Concept on how to make customer get ‘hooked’ to your startup product by understanding 4 elements: What internal and external triggers user might experience, What action you expect user will do after the trigger, What reward would you give your users after they did the action, and what kind of investment you expect they will make with your product. Both Nir and Sangeet said that success must be planned and built from the beginning. Nir said we must create the user habit, user should use our product as often as possible, once a day habit at least. Our product should be on top of user’s mind when a trigger (inside or outside users) happens. Like Facebook and Twitter successfully built habit of updating status whenever we felt the ‘trigger’ from inside: being lonely or uneasy, or Instagram make us post our food pictures more often than before, or Google make us having a habit of Googling whenever we felt unsure about something. Sangeet said we need to design our growth, the growth of our startup need to be repeatable, have user generated growth, scalable, and sustainable. The repeatable growth pattern: we need user to send out content to external network. To be able to do that, of course we must understand what motivate user to spread the word. – Why users spread the word? – What mechanism will they use, what are they send out? – Where will they spread the word? – Why recepient will interested in that? – How will you manage the whole process? They’ve been explaining more details on their talks, you can search their presentation online. Nir is preparing his forthcoming book Hooked and Sangeet with his book Platform Thinking. Wish you both success with your new books! All the best for you and your startups! Thanks for sharing, Ollie. Very inspiring.